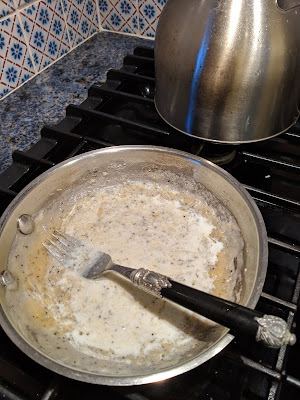 As a fourth generation Texan, biscuits and gravy are a bit of a food staple for me. Every biscuit is different. Some people prefer biscuits that are mile high and bread like made with eggs, while others prefer a more dense yet flaky, cake like biscuit. I'm a cake biscuit girl. My Grandmother used to whip us up a few biscuits in her Fort Worth Kitchen when I would spend the night. 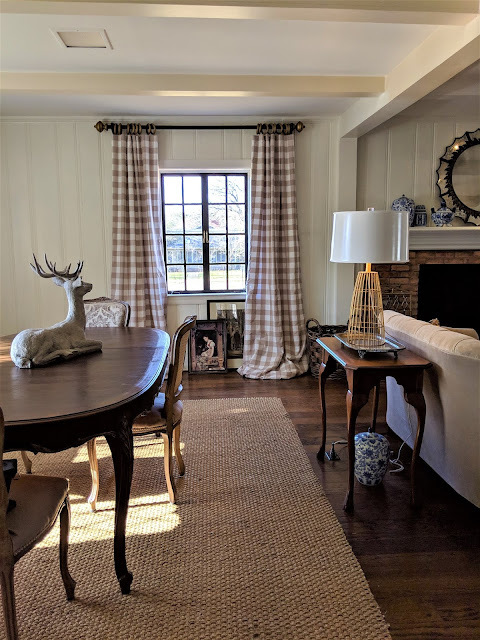 I would sit with great anticipation; perched upon the edge of my "X" back chair, next to the maple drop leaf table, drinking my saucer of Café O'lait, waiting on the scrumptious smelling biscuits to make their debut. (Yes, as a child I had coffee in a saucer.) We'd feast on real butter, red current jelly and flaky cake like biscuits. 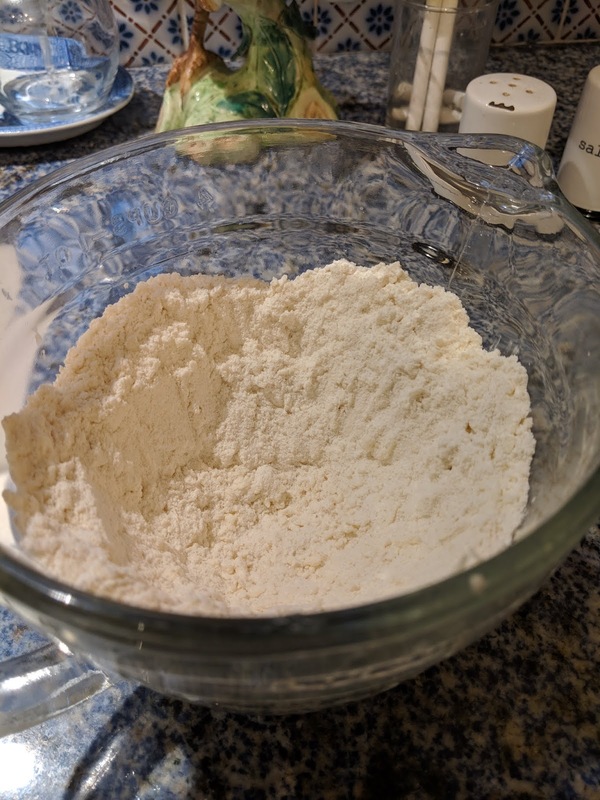 In a mixing bowl combine flour, salt, sugar and baking powder. Mix well with a fork to combine. Using a grater, grate butter into the bowl. Make certain that your butter is cold allowing it to grate properly. Grating your butter will incorporate the butter easier into the flour base and help you to create a lighter biscuit. After grating mix the butter well into the flour by using a fork. The result should be a evenly mixed course base of flour and butter. Make a well in the center of the flour by pushing the end of a fork into the center, then pressing the flour back against the edge of the mixing bowl. Make your way around the bowl to create the center well. Add your milk into the well all at once. 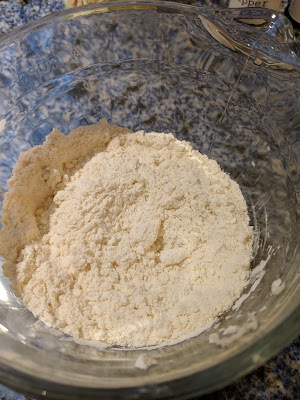 Then mix the milk into the flour using a fork until a soft dough is formed. 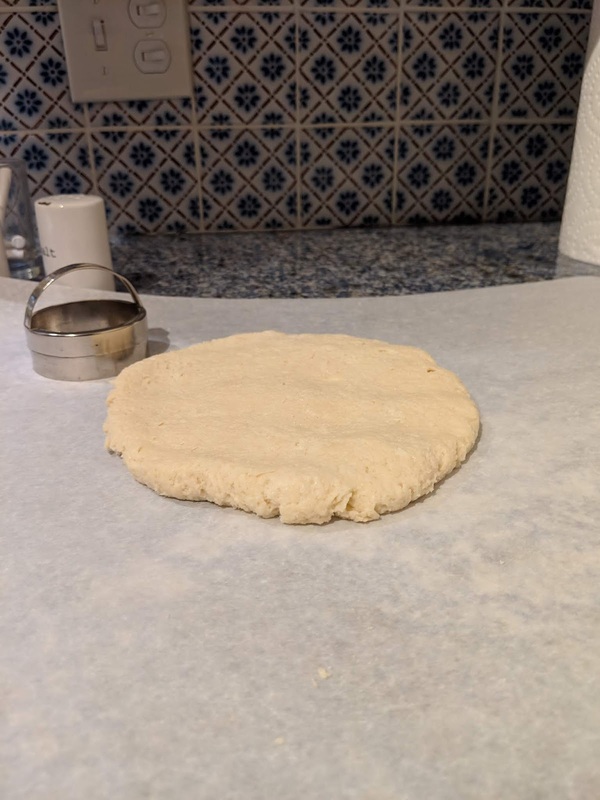 Turn the dough out on to a piece of parchment, or if you prefer a floured marble/granite surface. Using your hands flatten the dough by patting to about 1/2" thickness. 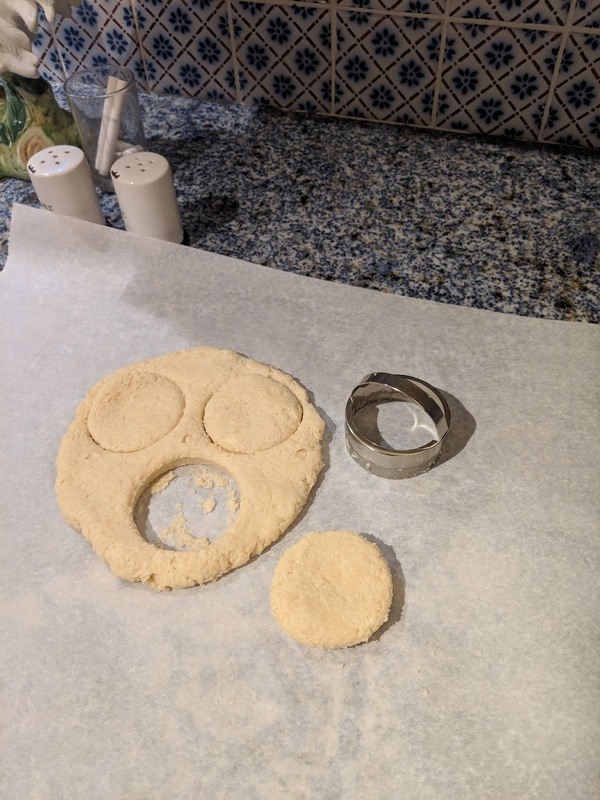 Using a medium sized biscuit cutter (about 3"), cut the biscuits from the dough setting them aside on the parchment. This recipe yields six 1/2" thin biscuits (see notes below). 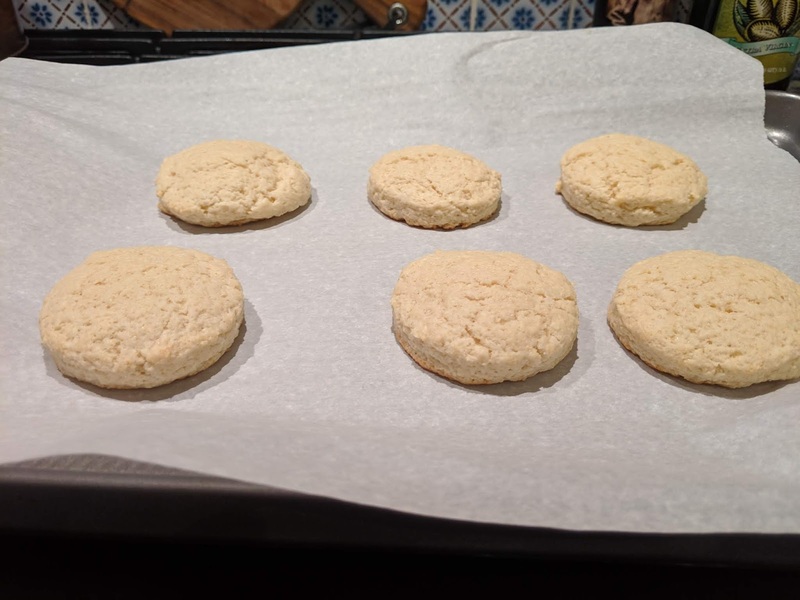 After cutting your first set of biscuits from the dough, pull the left over dough together into a ball, pat it out and cut another biscuit. 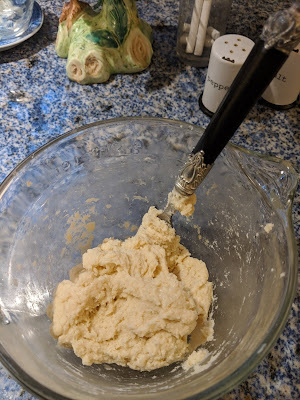 Repeat the dough gathering and patting out until you have cut all of your dough into biscuits. 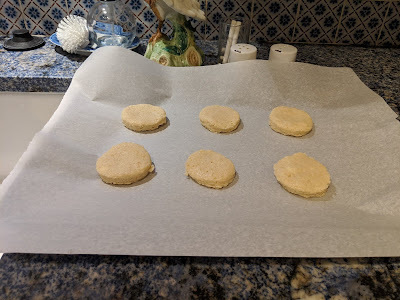 Line your baking sheet with parchment, then transfer the biscuits to the parchment lined tray, arranging them evenly upon the surface. Bake at 350 degrees for 4 minutes, then turn the tray 180 degrees and continue baking another 4 minutes. 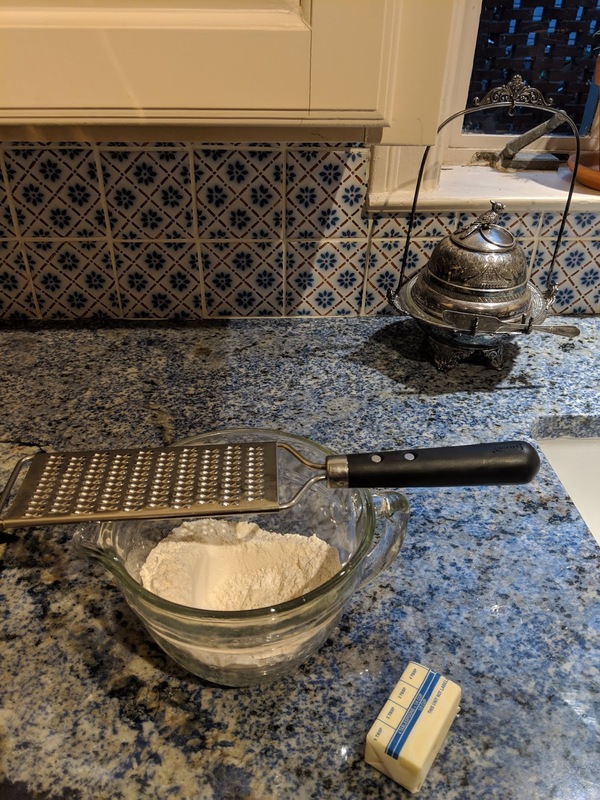 Turning the tray at half bake time insures for an even bake, preventing one side of the biscuits from being darker than the other, or the centers being chewy. (Not turning the tray may result in the biscuits at the back of the oven becoming more browned on the backside and the biscuits along the front oven door edge becoming a little chewy in the middle. I half bake turn everything; break, cookies, cakes to ensure an even bake.) Total baking time is 8 minutes for thin 1/2" biscuits (see notes). I'm afraid the above ingredients are an estimate. I don't measure when making gravy. It's like learning to ride a bike in Texas, most of us know how. It's like breathing! I'll do my best here; melt your butter in a skillet, sprinkle in about 2 tablespoons of flour evenly over the skillet by using your fingers, mix it well with a fork, sprinkle salt and pepper to taste. 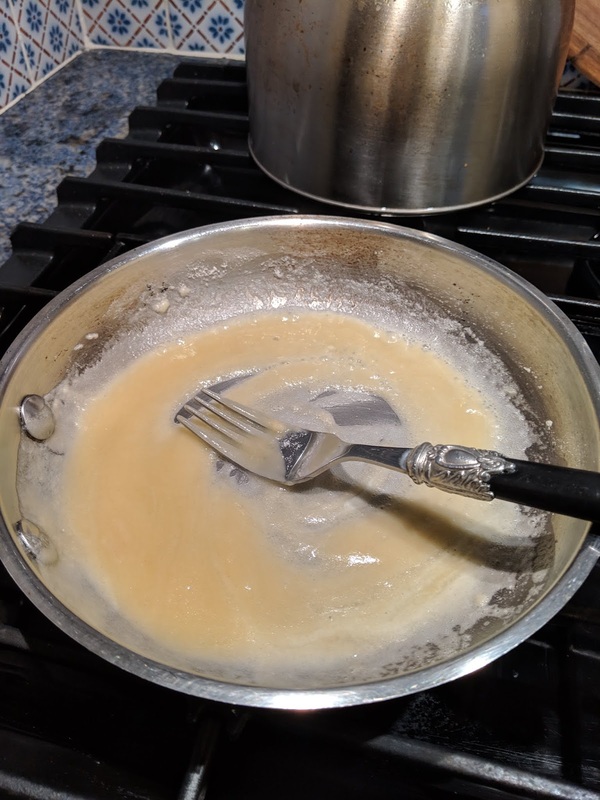 Mix the flour, salt and pepper with the butter until a smooth roux forms. It should be bubbling and thick. Turn off burner, or remove from heat (this is the trick to prevent lumps), then slowly add the milk as you stir the flour and butter with a whisk or fork creating a roux. I tend to add milk a little a time, stir it to combine, then add a little more milk, this too helps to prevent lumps. Dumping the milk in all at once makes it much more challenging and almost guarantees lumpy gravy. Be patient, introduce the milk slowly, small amounts at a time allowing the flour base and milk to become best friends, creating a smooth, rich, creamy gravy to be proud of. When it is first combined the roux will be thin. Return skillet to low/medium heat and stir the gravy until thick and bubbly. 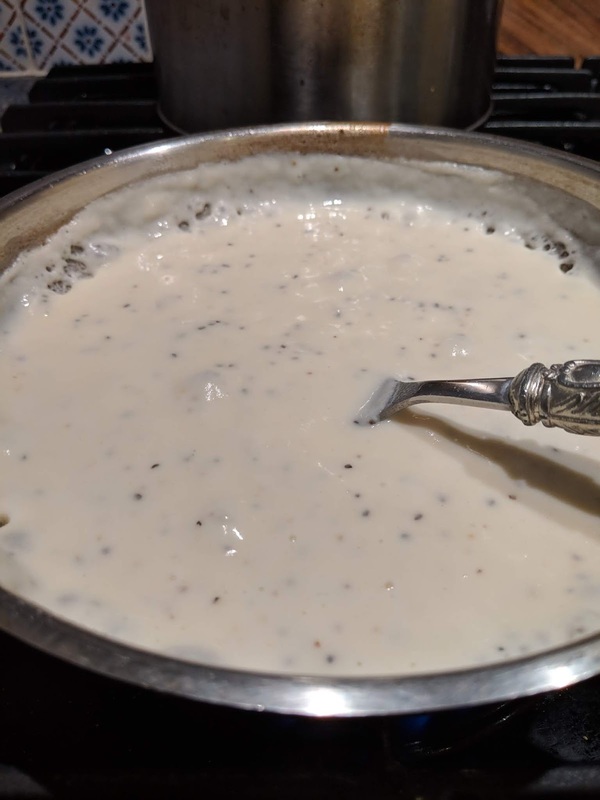 This recipe will yield about a 2 cups of gravy which is perfect for the 4-6 biscuits. 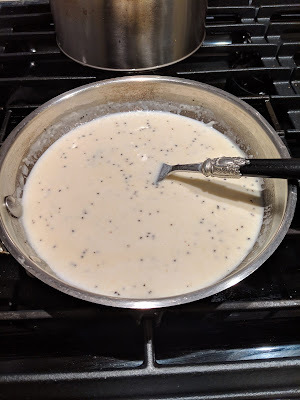 If it gets too thick, remove from heat and add a little more milk stirring well to combine. 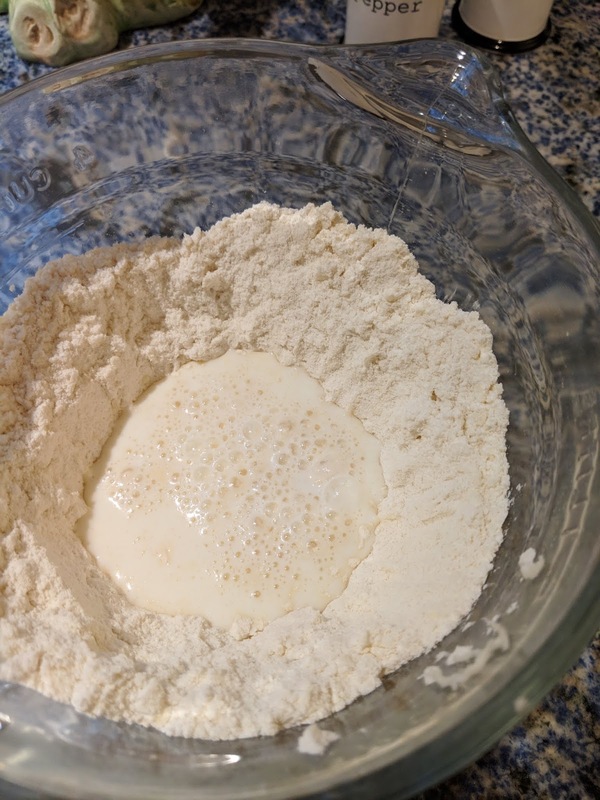 I make thin biscuits when I plan for gravy (patted about 1/2 inch thick) . 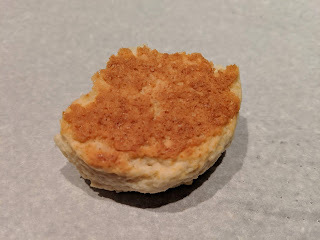 When I plan to serve them with butter or jelly I make a thicker biscuit that can easily be cut in half (patted an inch thick). 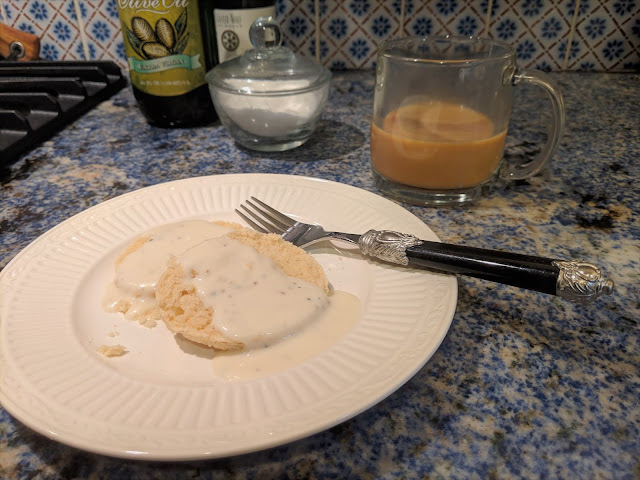 The reasoning is that I like my biscuit to gravy ratio to be similar. It's a Texan thing, you want a gooey center with a crusty bottom in every bite. If you wish to have a thicker, taller biscuit; roll them out about an inch thick and extend the baking time from 10 minutes to 12, turning your tray 180 degrees at six minutes for a proper, even bake. 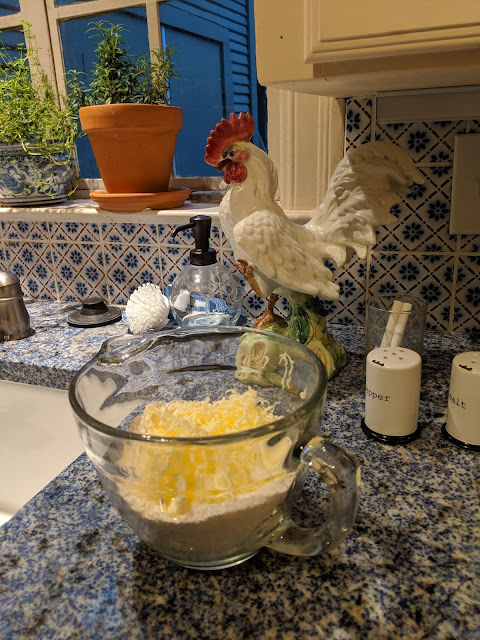 This recipe will yield 4 thicker biscuits. She quitely appeared from nowhere, sitting pretty as she can, ever hopeful. "Do I smell biscuits? I think I smell biscuits. 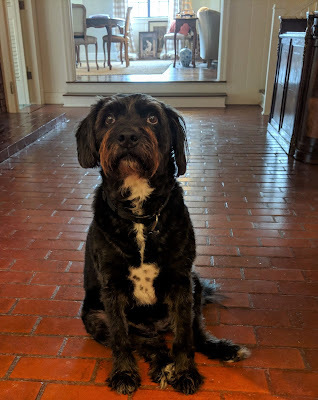 May I have a biscuit pleeease... " She's literally whining, looking at me, then glancing into the oven door. Of course she scored a bite. How could I resist that adorable face? I remember biscuits, milk gravy, tomatoes and cantaloupe for breakfast. 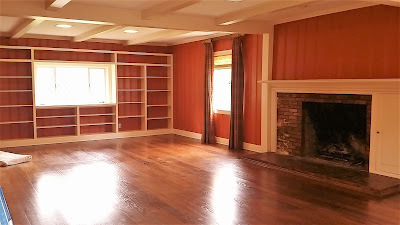 Thanks for bringing back those memories! My Grandmother made fat fluffy biscuits so that's my favorite but I too like them both ways. I am in Ft Worth also. I like your blog.